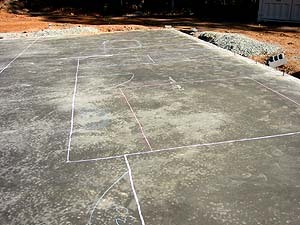 Under the design/build concept, the entire floor plan was marked with chalk directly on the concrete pad based on the house design. Then the windows were added when the room layouts were finalized. 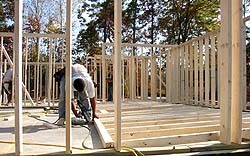 Seeing the vision in full scale made the adjustments easy for windows/doors/walls and thus avoided costly mistakes during the framing process. 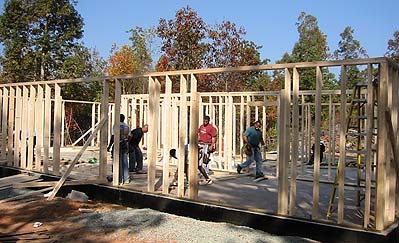 Marc Lockley and his framing crew did an outstanding job of framing accurately and quickly. 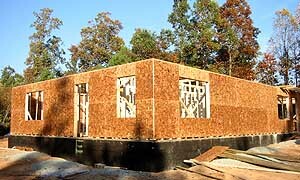 The first day they worked from 6am-6pm and completed the interior walls and exterior walls including OSB sheathing on the outside. 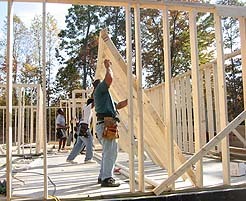 A week later, again in one day, all the roof trusses were set in place with block framing (stabilizes the roof trusses by only nailing into truss on outside walls); the OSB sheathing was glued and nailed to the roof trusses, home-wrap was installed on all exterior walls and a weatherproof protective barrier covered the roof. 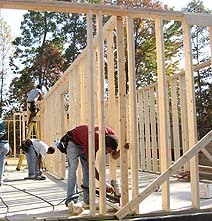 End of first day framing!